A new, high-tech traveler is catching a ride on Alaska’s largest passenger ferry. At the end of October, the Columbia, which can carry up to 500 travelers, set off on its two week, nearly 2,000-mile course from Bellingham, Washington to Skagway, Alaska. But for the first time, an onboard system is measuring temperature and levels of salt, oxygen, and carbon dioxide in the seawater every three minutes, giving scientists a detailed look at how climate change could impact the northern Pacific coast. The main focus of this experiment, which researchers hope will run for at least five years, is ocean acidification. Scientists want to know where acidification is already happening and predict which areas will be at risk in the future. The project is the latest collaborative effort to understand whether ocean acidification, a by-product of climate change, could affect Alaska’s unique coastal ecosystems and, ultimately, its young aquaculture industry. Alaskan officials like Governor Bill Walker hope shellfish and kelp farming can be an area of future economic growth for the state, according to Samuel Rabung, aquaculture section chief at the Alaska Department of Fish and Game in the Division of Commercial Fisheries. But successful aquatic farming depends on healthy marine ecosystems. Ocean acidification has already negatively impacted shellfish hatcheries in Oregon and Washington, says Evans. For example, oysters at Whiskey Creek Shellfish Hatchery began dying off in 2006, according to an article by YaleEnvironment360. Eventually, researcher Burke Hales – who is also involved in ocean acidification monitoring projects in Alaska – found the acidity of the water the hatchery pumped in from the nearby ocean killed the oyster larvae in large numbers. Now, Evans says, hatcheries in the Pacific Northwest monitor and treat their water to make sure this doesn’t happen again. And researchers like Evans and Hales are setting up a monitoring network in Alaska to detect acidification before it becomes a problem. Ocean acidification is the byproduct of increased levels of carbon dioxide in the atmosphere. As air interacts with water on the ocean’s surface, the sea absorbs carbon dioxide from the atmosphere. When carbon dioxide dissolves in water, the molecules react to create carbonic acid, which then drops a positively-charged hydrogen ion as it breaks down into two other elements, bicarbonate and carbonate. A higher concentration of free-floating hydrogen ions is what makes something more acidic, measured by a lower pH. Scientists believe the world’s oceans took up about 25 percent of the carbon emissions humans added to the atmosphere between 2002 and 2011 and estimate it has absorbed about half of the extra carbon produced by humans since the Industrial Revolution. The ocean’s water naturally tries to counteract this acidity. To do this, carbonate molecules combine with the free hydrogen ions, lowering the water’s pH and forming more bicarbonate. This reaction results in less carbonate available to combine with calcium to form shells and coral reefs. Sometimes, calcium carbonate structures will dissolve so the carbonate can neutralize the hydrogen ions. The more carbon dioxide the oceans absorb, the more difficult it is for shell-based organisms to survive. Ocean acidification in the open ocean is pretty straight-forward, says Evans. But the coastal ocean is a more complicated environment. Freshwater runoff at the shore, circulation of seawater from the bottom of the sea to the surface and down again, tides, and other factors can all influence how carbon dioxide is absorbed and how acidic the water in a particular area becomes. The Columbia provides an unusual opportunity to collect detailed, regular measurements across a large area of coastal ocean at risk of acidification at regular time intervals. 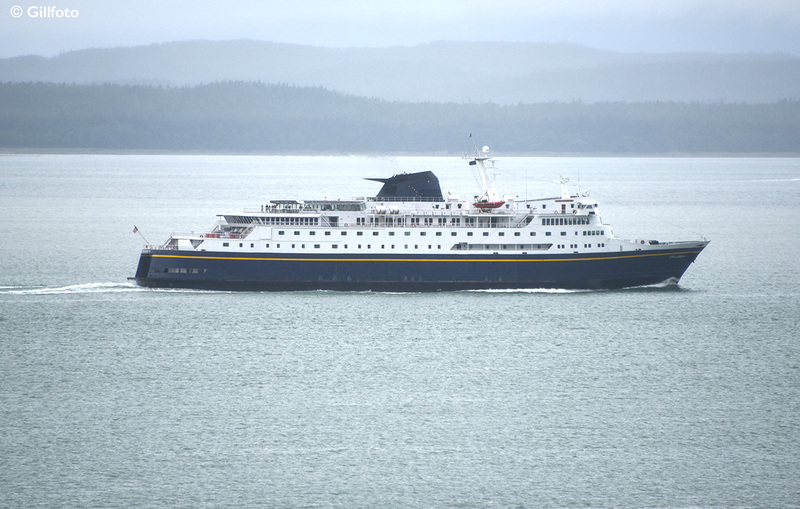 The vessel makes the same trip – to Skagway and back – every two weeks, all year. Other coastal water monitoring projects currently underway in Alaska, such as buoys or systems installed at shellfish hatcheries, monitor just one location over a continuous time period. With the ferry docked for repairs in early 2017, Evans and other scientists took the opportunity to install the specialized system. Every three minutes, the device takes a water sample six feet below the surface then pumps it up into the main device on the ferry’s car deck, according to the Alaska Ocean Acidification Network, the collaborative organization behind the project. The system takes water temperature below the surface and again when it reaches the car deck, where the device also measures dissolved oxygen, salt content, and carbon dioxide levels. The data is then uploaded to a database maintained by the National Oceanic and Atmospheric Administration. The data from the Columbia – including the measure of oxygen, salt, and temperature – is expected to help scientists including Bidlack and Evans with efforts to track acidification and changes in sensitive and unique ecosystems, like the Tongass Rainforest in Southeast Alaska. It could also provide insights that Bidlack, Evans and their community partners could apply to projects to protect Alaska’s growing aquaculture industry from the effects of climate change.